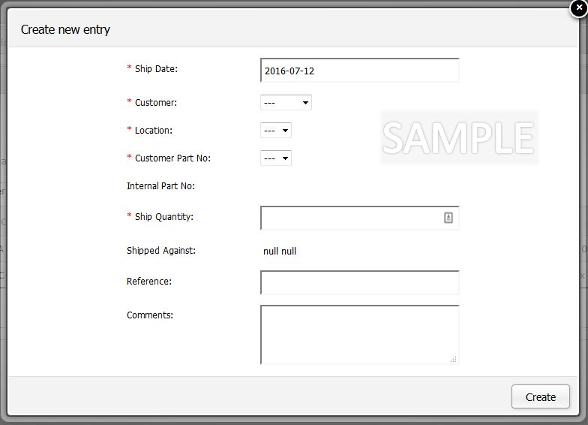 The Shipments tab is where you will input all of the shipments to your customers. Customer: The customer name. We use the nickname you have given the customer for brevity. Ship Date: The date of this shipment. Shipped Against: The order date that this shipment was shipped against. Ship Qty: The quantity shipped. Reference: The shipping identification information supplied by the carrier. Ship Date: Defaults to today. Click in the field if you wish to select a different Ship Date using the popup calendar. Customer: Select the customer for the Shipment. Location: Select the location your customer designated for this Shipment. If your customer has only one shipping location, this field will auto-populate. Customer Part No: Select the part (by your customer’s part number) for this Shipment. If this customer location only orders one part from you, this field will auto-populate. 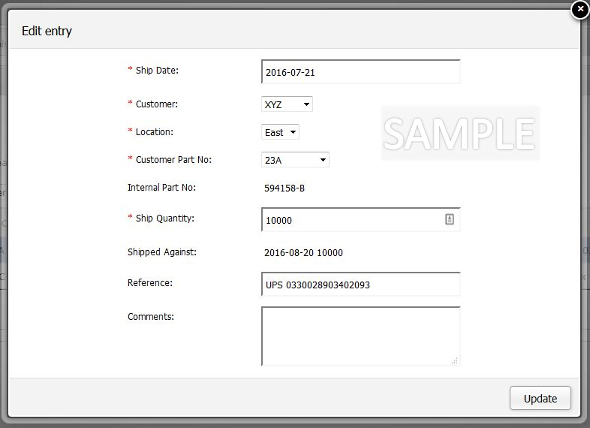 Internal Part No: Automatically displays your part number for this order as confirmation. This field is not editable. Ship Quantity: The quantity of this Shipment. There are special cases noted on Ship Quantity below. Shipped Against: This read-only field is automatically populated with the next open date / quantity for this customer / location / part as confirmation. If this is not the correct date and open quantity for this customer / location / part, see below for further instructions. Comments: Any comments you wish to add to this Shipment can be entered here. Once you have completed entering the data for this Shipment, click “Create” and you’re all done! You will be returned to the table view, and your new line item will be momentarily highlighted in the table. This is the Edit Entry form to edit an Existing Shipment. For a description of each field, read the Add a New Shipment text above. 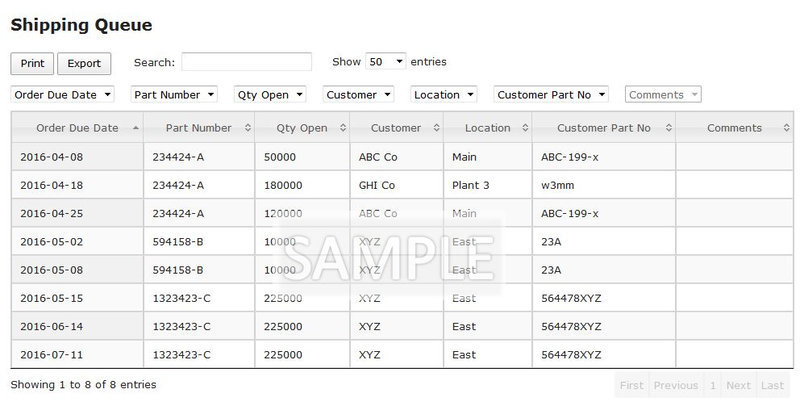 To begin an Edit on an Existing Shipment, first you must click on the table row you wish to edit. Once a row is highlighted, the Edit button will become active. To Delete a Shipment, you must first click on the table row you wish to Delete. Once a row is highlighted, the Delete button will become active. Shipments are placed against an Open Order in the PiQ System. Order Quantities and Shipping Quantities must ultimately match up to clear the Order queue properly. Ship Quantity equal to Open Quantity: the Shipment is accepted and the Order is Closed. Ship Quantity is less than the Open Quantity: The Shipment will be accepted, but it will leave the Order in Open Status until it is filled. A prompt will alert you to this condition. Shipping less than the Open Quantity is generally used when you are making a partial shipment against an order with the intent of shipping the remaining Open Quantity at a later date. If you wish to ship less than Open Quantity AND you wish to close the order at the reduced quantity, you must first change the order to the reduced quantity, then ship the total to close it out. You cannot enter a Shipping Quantity greater than the next Open Quantity. If you are overshipping, you must first increase the Order Quantity so that Open Quantity is equal to the Shipping Quantity. The Shipping Report tab is where you view everything that needs to be shipped. The Shipping Report is a read-only table. Shipments are created from the Shipments tab. Each item with an Open Quantity is listed, in ascending order of Order Due Date. Order Due Date: The date each line item is due to the customer. Part Number: Your internal part number that corresponds to the customer’s part number. Quantity Open: The quantity due for each line item. Comments: Any comments associated with the Order Line Item.